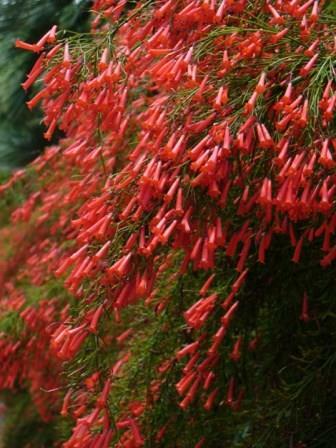 The Red Firecracker Fern produces loads of 1" showy red tubular flowers that are born in large loose clusters throughout the warmer months of the year or nearly year round where winters are mild. Excellent for Hummingbirds! This is a durable and long-lived, clump forming perennial that requires little additional care once well-established. 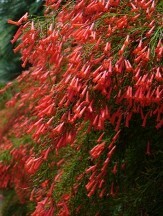 The Firecracker Fern has excellent heat and sun tolerance as well as moderate drought resistance once well-established. It is even listed as being suitable for xeriscaping. 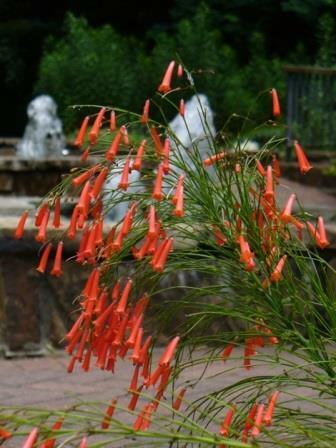 Firecracker Fern is listed as a Texas A&M Outstanding Coastal Plant as it has excellent resistance to soil and wind born salts, though it could use some protection from harsh, drying winds. 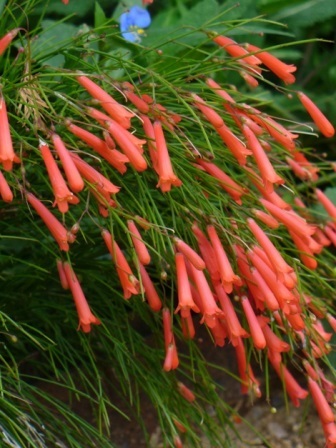 The Firecracker Fern is also known as the Coral Fountain Plant as it looks like a fountain of green, fine textured stems covered in colorful tubular flowers originating from a central point. It looks great spilling from containers, raised beds, over walls, and can even be used as an informal groundcover. 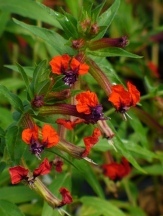 It is a clump forming perennial but stems may root where they touch bare soil. In areas where temperatures fall below about 25oF the Firecracker Fern will typically act as a die-back perennial, even into portions of zone 8B if given a protected location. 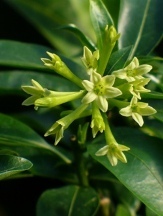 Like most root hardy tropical plants, it will be best to establish your plants early in the season so that they can develop a large and vigorous root system before winter sets in. Good drainage and a loose breathable mulch are key, especially where winters are cold and wet. Easily overwintered in containers where not hardy. Soil & Moisture: Average moist, well-drained soils but has moderate drought resistance once well-established. Does well under average garden conditions.